Chair of Electrical and Computer Engineering joined GW faculty in August. Ahmed Louri arrived at the University of Southern California in the 1980s as a “shy graduate student,” his mentor said. But even then, Jean-Luc Gaudiot could see something special in the aspiring computer engineer standing in his office doorway. 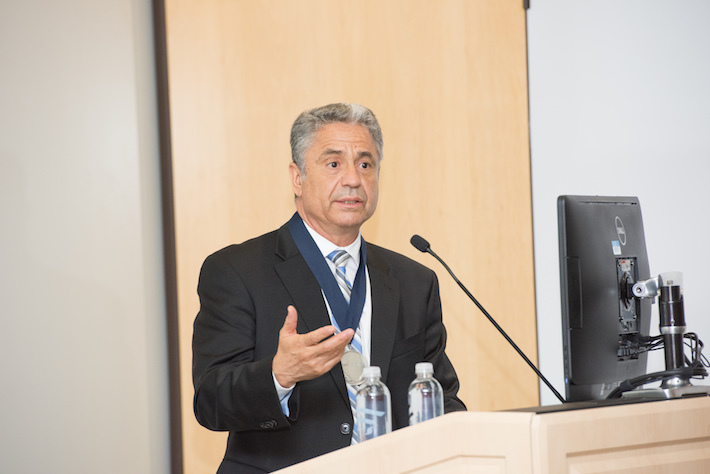 More than 30 years after that first encounter, at an event that featured remarks from George Washington University President Steven Knapp, Provost Steven Lerman and School of Engineering and Applied Science Dean David Dolling, among others, Dr. Louri was installed as the David and Marilyn Karlgaard Professor, becoming the first faculty member to hold the title. Dr. Louri was most recently a professor of electrical and computer engineering and the director of the High Performance Computing Architectures and Technologies Laboratory at the University of Arizona. He also chaired the university’s computer engineering program from 2000 to 2006. He previously was program director for the National Science Foundation’s Directorate for Computer and Information Science and Engineering, overseeing an annual research portfolio of $800 million. The position was established through a family bequest from Board of Trustees member David Karlgaard, D.Sc. ’74, and his wife, Marilyn. The longtime GW benefactors were recognized Wednesday, Dr. Dolling said, “for their ongoing support of education and SEAS.” The Karlgaards had previously established two scholarships at the school: the Karlgaard Scholarship in Computer Science and the Karlgaard Scholarship in Computer Engineering, both for rising juniors and seniors. 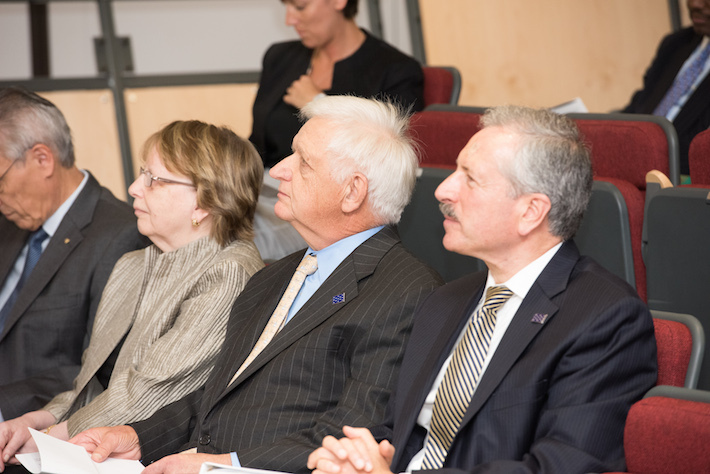 Their decision to fund an endowed professorship at SEAS was inspired in part by David Karlgaard’s experience at GW as a student, faculty member, SEAS National Advisory Council member and university trustee. His doctoral research at GW focused on computer architecture, and he said he was happy to have the first Karlgaard professor be a world-renowned expert in the same field. Those final pieces are critical to the future of computer architecture, Dr. Louri said. The field, which he called “the bridge between hardware and software,” has expanded rapidly since the 1950s alongside an evolution of computing platforms that began with room-sized mainframes and progressed to laptops and smartphones. Today, computer architecture, Dr. Louri said, “impacts every human activity,” including education, communication, transportation, commerce, health and manufacturing. A major challenge in the field, he, Dr. Karlgaard and Dr. Gaudiot said, is power management. As devices get smaller and demand for speed increases, computer architects are hitting a power wall—“power density on the chip increases exponentially with the speed we’re trying to achieve,” Dr. Louri said. Multi-core processors, he said, are the method to solve this issue. The philosophy shift divides a single core into several to lower power consumption—a school of fish vs. one big fish, Dr. Louri said. The next quantum leap in the field, he added, could exist at an intersection of big data, sensor networks and artificial intelligence. A key pillar of Making History: The Campaign for GW is to enhance academics. Doing so enables GW to recruit and retain world-class faculty and fund innovative research. Endowed gifts play a fundamental role in the continued growth and evolution of the university, creating lasting legacies that offer long-term benefits to students and faculty and ensure GW's ability to thrive in the years ahead. SMHS neuroscientist joined GW faculty in 2014. Heart research leader joined the George Washington University in January.